Apart from its energetic layers, harmony and peace radiates out of it when you take a closer look. I use the ET everyday to activate water and herbs. Energetic centers can be harmonized and interconnected with its help. I tried this out during my mediation. I found out almost immediately in which of my chakras the problem was and then I can pay attention to specific levels. In my experience, the ET is a very useful and healing kind of energy for humans. However, the energy should be used with consideration and one should experiment to find out his/her individual duration of its use not to overdose. On the other hand, it is easier to get rid of the excessive energy than to regain it. My example of the influence of the ET on the shape and strength of individual subtle bodies: After three weeks of using the ET the shape of aura of my etheric, emotional, mental and spiritual bodies changed. The original shape of a spheroid (an egg) three weeks ago almost changed into a ball. They seem to be circles in the sketch. Only my astral body was a ball three weeks ago and it kept its shape (a circle). Chakras of individual bodies also got changed. They are more developed now than three weeks ago, have more „threads“ and there is no undulation. My aura also got stronger. 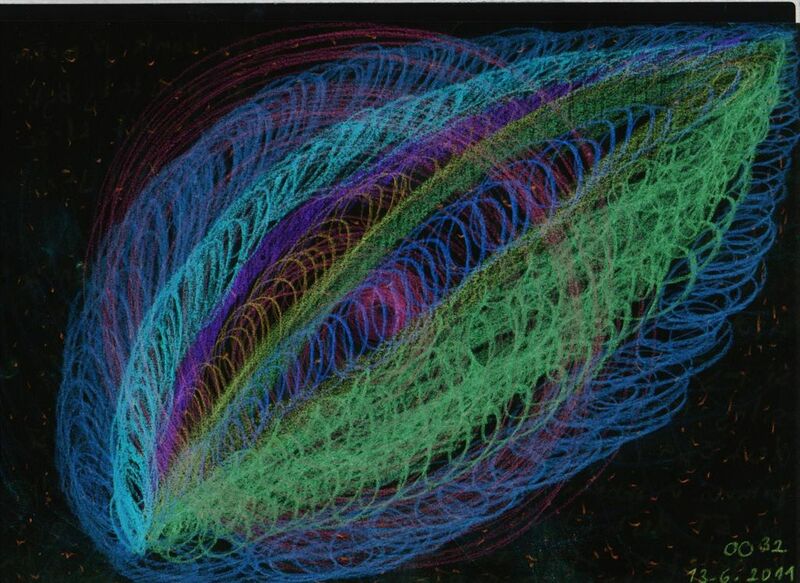 The picture on the right shows energetic currents of the ET ball. The text of the message related to the right picture: The light that the ball radiates can lead to a big shift in realizing the essence of being. 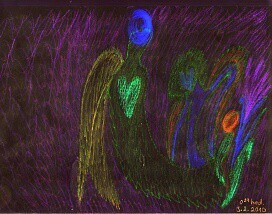 Owing to this, almost forgotten inner self can be awakened through Love and Light on many levels. Whoever tries to find his/her way, will find it in the end. Whoever wants to get well through this energy, whoever would like to have a rest and sort out his thoughts – what to expect in the future – this is a strong meditative means. I tried to relax and calm down and a thought to use the ET entered my mind. I just aimlessly kept on observing it, holding it in my hands. After a while in the dark, it seemed to me as if I had some flickering in front of my eyes or whatever it was. I tried to focus and as I was looking at the ball, it changed into the Sun, a little sun as if it had eclipsed (it was almost white). I saw the corona and gentle rays were coming out of it, but it was not a shadow. And this is not all! Although I got frightehed and everything got lost subsequently, I felt a temptation and tried once again. And again, the white sun started to emerge from the ordinary dark shadow of the plate. This time, I persisted to look at it for a longer time. The rays began to spread all over the plate. It reminded me of the fountain with the steam. Very similar. And very soothing and pleasant. Nothing specific was felt. No warmth or coldness. It was just relaxing. But all of a sudden it came: I narrowed my eyes a bit and suddenly I saw crazy radiation all around my hands and the plate. A grey-white light with delicate rays and it all waved in the same way as the steam of the fountain. And one more finding – it was concentric as a magnetic field and coming out of the circle in the plate. Of course, I took it only as an illusion or an optical coincidence a day later. So I tried it out for the second time today. After several moments of concentration, it began again and it went on in the same way. The fact is, I was not aware of time at that moment. It could have taken about 10-15 minutes, before I felt a kind of satisfaction and in a good mood. There was no need to hold the plate anymore. I am not a plant-grower at all. Everytime I had to take care of some plants I overwatered them, so they rotted away or they withered. It was not until this summer that I was given a cyclamen for my birthday. I put it right in the middle of a tiny round ET, not far from a radiator. We have permanent temperatures around 22 degrees Celsius inside our apartement building (block of flats). In summer the temperatures become even higher, because the house windows are oriented southward and they are right under the roof. 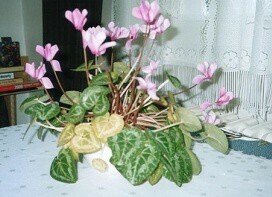 I would water the cyclamen every third day because I did not know how to look after it. I laid the ET to it to flourish. It had about 15 blooms from the very beginning and many others were about to start to be in bloom. It had beautiful green leaves that never fell off. 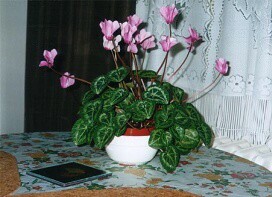 A cyclamen has always withered to my mum who has been fond of growing plants. It has always stopped to bloom after 2 months and withered within 4 months. My mother told me that cyclamen should be kept in a cool place and have enough water. However she did not tell me this till the fifth month of having my plant nearby the radiator and at the window where it was exposed to direct sunlight due to not very thick curtains. I tried to remove ET after about three months and found that its leaves started turning yellow, buds withering and it did not look well at all. I would also try to water it every second day and move it to a cooler spot, but it did not help at all. I laid the ET to it again, trimmed its yellow leaves. After 5 days no leaves seemed to be turning yellow and the plant was in bloom again. It is the middle of January now and the cyclamen is still the same. As though I was given it for my birthday again. I wish you successful work with the ET. It is, from my point of view, very useful and it gives people an opportunity to consciously awaken Christ´s principle and act of one´s own free will. I send warm meeting and thank the Lord for the invention of a new era. Many thanks, Your ETs are really better and stronger than ordinary so called Tesla plates (purple ones). I had the opportunity to try out and use the ET during my university studies of philosophy, where there used to be an extremely tense atmosphere. It was characterized by various invisible energetic tensions during lessons, as well as lectures. These tensions often decreased a lot when I used the ET. Based on this experience with the ET, I pressume that it is its presence which helps to strengthen and harmonize our energetic system in case of mental and other pressure caused by others. Notice: We do not give addresses to protect privacy. We thank very much those people who have written on for they are of great help for ET. We will be very grateful for your response on how you feel its energy or other extra-sensory perception or experience with the different kinds of use.